I loved the first in this series, somehow missed book two but that didn’t matter as it was still easy to keep up with everything that had passed in this book. Its one of those series where each book is complete and focuses on one character from the team, although we meet the others via the story. 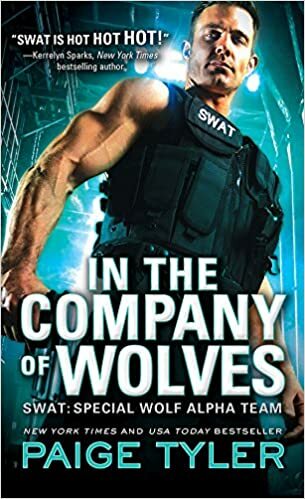 This time its Becker, who’s out on a raid and stuck in the midst of a deadly shootout when he smells a female werewolf, and his attraction is so mind altering that he hides her from his colleagues and leaves the scene. He can’t get her out of his mind though so of course he uses his contacts to track her down. I liked Becker, he’s so entranced by Jayna that he does what his instinct to protect her tells him, and that goes against all his training, his loyalty to Jayna, even though they’ve just met, wars with his loyalty to the team. He can’t/won’t risk them but feels a real need to get her out of the situation she’s become caught up in. He needs to do some quick thinking. Jayna, she’s a good lead. One of those who’ll stand up for herself, not a bullying, hectoring sort, but a person that will do what she can to protect herself and those she loves. I like those characters, a change from the simpering, helpless heroines we often get presented with. You know – the sort who have to have a big, strong man looking after them..I’ve no patience with those who won’t help themselves. Jayna isn’t one of those, and has been looking out for herself since a horrific event at home forced her change. Now though she and her pack have become indebted to a ruthless criminal gang, and though she hates what they’re doing she’s done as her Alpha instructs. It was just simple stealing at first, but the violence has upped recently and her Alpha seems to like what’s happening. Far from it being just a few weeks as he promised he looks set to stay with them indefinitely. When Becker finds out he’s desperate to get Jayna out, but she won’t leave without her pack mates…. Its a fun read, decent story and believable, but it didn’t grip me quite as much as the first one. There’s some sensual scenes and lots of action but somehow I felt there was a bit too much Becker and Jayna and I’d like to have seen more of the SWAT team. They do come into the story but as a minor role and I missed them and the charisma between them all. Stars: four, a really good read but not quite the five. Genre: Romance, LGBTQIA, Fantasy and paranormal. I like shifter romance so was pleased to be asked to review this. Its all four serial parts put into one complete book. Its still quite a short read for me at 2700 kindle locations, but its complete, well written and has no loose ends. The story itself only covers a few days, and I missed the tenderness that usually develops in romance over a longer time, or the angst when there’s conflict. It just felt very straightforward, cut and dried, not much emotion. The drama; Nate’s niece who’s gone missing, was a well written teen. They do think the world revolves around them, and need to learn their own mistakes. I so felt for her, she’d been hoping for a happy family reunion and what she got was the stuff of nightmares. Poor kid. I loved the relationship between her and her uncle Nate, I could feel the love and respect between them. He was so scared for her especially when he found out just what she’d got wrapped up in. That angle felt a little too much for me, there’s so much packed in with werewolves and vampires, and though I love all that usually, in such a short book it just felt rushed. There was lots of action towards the end, but it just didn’t really do anything for me, I didn’t get that sense of danger that I needed from it. Maybe because I didn’t really feel I knew the characters involved or the settings and local dramas enough to get really concerned. Its a good story and one I enjoyed but just a bit lightweight for me to rate higher. However for those who want a simple, easy M/M shifter romance this could be perfect and a five star read. Horses for courses etc. Stars: Three, a fun read but a bit light for me.